It's only when you grill leafy greens that they become simultaneously crunchy, caramelized, and charred. A little burnt, too. This is a good thing. The other bit of positive news? It takes just minutes to cook leaves on the grill. 1). Choose crisp, hearty greens. They should have at least some structure by way of a rib, bulb, or core. Really good options include kale, radicchio, escarole, romaine, Swiss chard, endive, bok choy, cabbage, and even butter lettuce (it's got a sturdy core). This could be as simple as brushing the greens with olive oil, salt, and pepper pre-grilling, or as creative as adding garlic, vinegar, citrus zest, chile flakes, onion powder, and so on. Basically, prepare them as you would if you were making a salad with them—coating them fully but not drenching in oil. For even more flavor, let them sit in marinade for 15 to 30 minutes (see below). 3). Marinate, before or after. Because you’re working with hearty greens, which stand up to pungent flavors, you're free to marinate them before or after grilling. 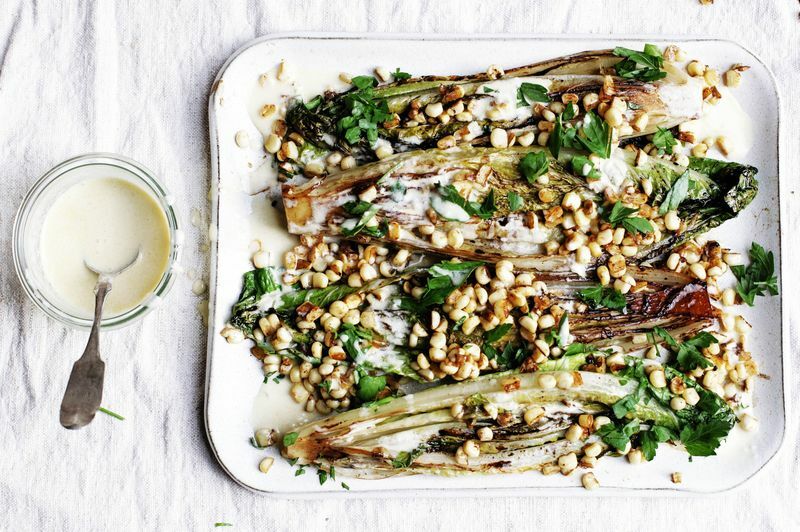 You could sweeten radicchio with some aged balsamic and honey, or brighten bok choy with lime juice and fish sauce. Go wild! If you marinate before grilling, the greens will still be crunchy after. 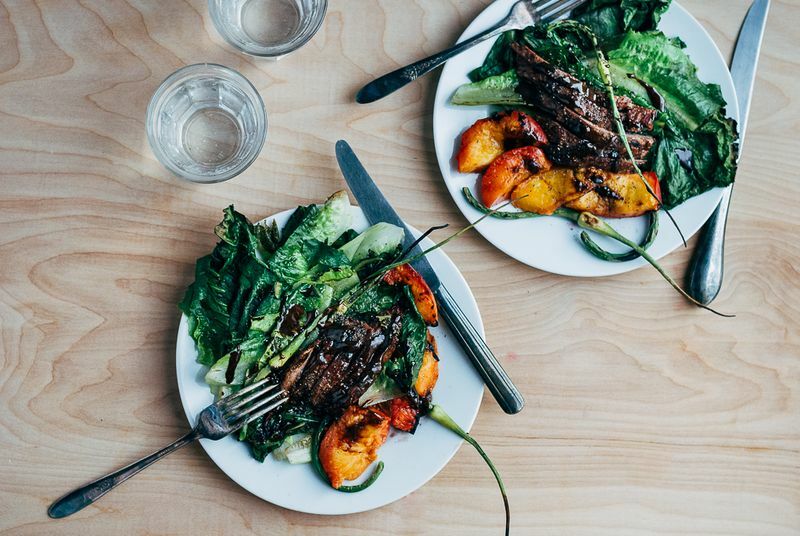 If you marinate after, be sure to season your greens judiciously—coat with salt, pepper, and olive oil—before the grill regardless; in the post-grill marinade, they’ll soften a bit from the warm liquid bath (it’s the same as marinating steak or other vegetables). 4). Get the grill hot! The goal is to singe the outer leaves while maintaining the crispness of inner ones. 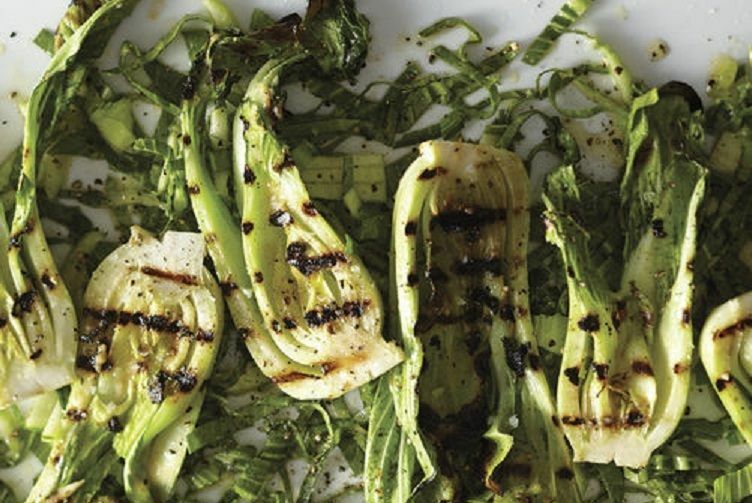 With a super-hot grill, the greens won't have to sit there for too long before they outsides are charred—which means they won't cook all the way through. Success! 1). Cut them, just yet. So that the greens don’t shrivel up from the heat, keep the greens large: You want the cores and ribs intact. For kale or Swiss chard, grill the whole leaf—rib and all. 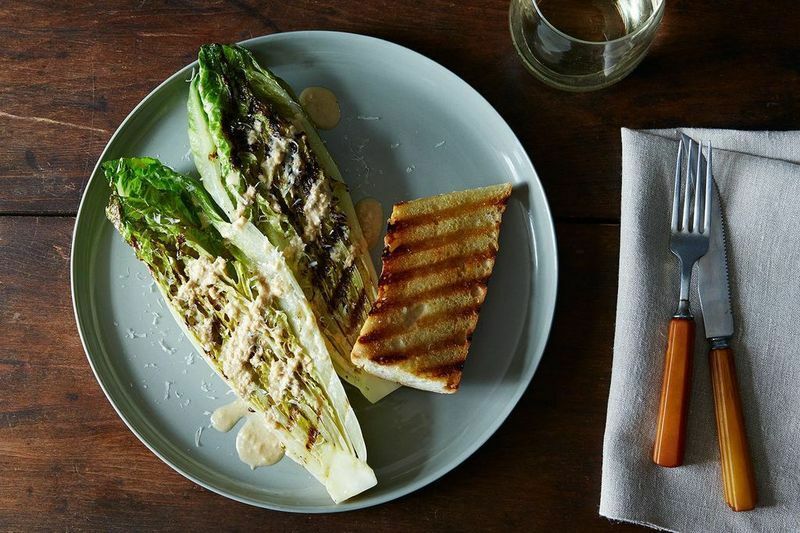 For endive, bok choy, Romaine, escarole, or butter lettuce, halve the vegetable before coating it with oil (and whatever else) and grilling. For bigger vegetables, like radicchio or cabbage, quarter them. You want to make sure a lot of the vegetable chars on the grill without exposing so much that the leaves fall off. Because you’re grilling at a high heat and leaves are more delicate than, say, steak, you want to pay attention so they don’t blacken all the way (a little burn, however, is welcome). Stand by and flip the greens on occasion so they get a nice char on all sides. 3). Cook dainty greens directly on the grill. You can still grill spinach, pea greens, or brussels sprout leaves, but you'll need some more equipment. Dress them as you would any other leafy green, but put them either in a grilling basket or rack, a metal colander, or a steamer basket before transferring them to the grill. The leaves will be protected from the heat a bit, but they’ll still get that smoky flavor. 4). Dismay if you don’t have a grill. 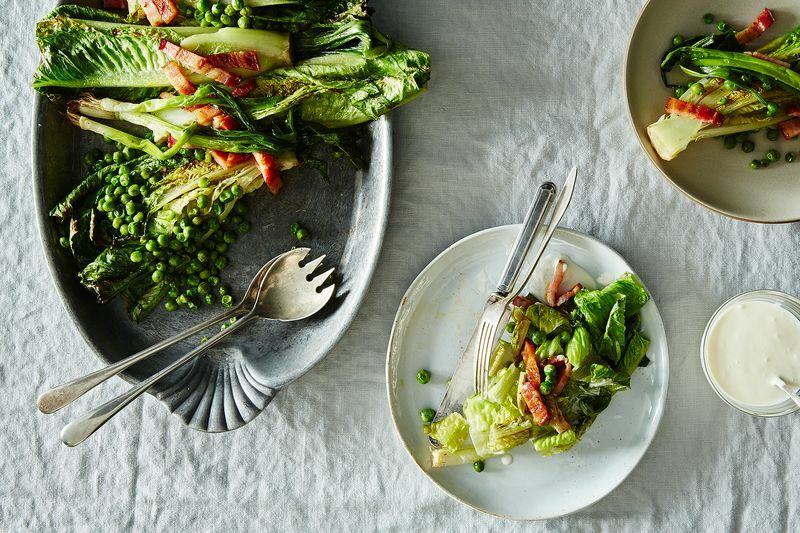 Singing greens brings out their sweetness, so it’s great to do even if you don’t have a grill. Prepare the greens as described above, then broil them. You won't get grill marks, but you will get a similar flavor and texture effect. You're welcome. This article was written by Ali Slagle from Food52 and was legally licensed through the NewsCred publisher network.